The Eastern & Oriental Express luxury train runs through Thailand and down the west coast of Malaysia. I recently achieved my goal of experiencing this journey. The train left Bangkok late one Wednesday morning in January. At full capacity the E&O Express carries 132 passengers and requires 22 cars. My trip consisted of 63 passengers (40% European, 30% American, 30% Japanese) and 17 cars. The nine sleeper cars came in three configurations: Presidential (two compartments per car and $3600 per person), State (four per car and $1930 per person) and Superior (six per car and $1300 per person). I expected my Superior compartment to be small, but was surprised at how small. It was the width of the couch/bed, with one skinny closet not large enough to hold my clothes. The couch flipped over to become the lower bunk at night. The upper bunk stayed in the wall because I didn't have a roommate. I don't know how two people could fit into that small space. A window in the door allowed me to look out the opposite side of the train. The equally tiny bathroom contained a full-length mirror with no room to stand in front of it. "Bouncing off the walls" is the best way to describe walking through the train. The passageways along the edges of the sleeper cars and staff cars were only two feet wide. I pointed my elbows outward to balance myself--and acquired a few bruises in doing so. I didn't sleep well the first night because of numerous stops and starts. The O&E Express frequently stopped for local trains on this single-track railway. The second night I woke only twice. My steward said that was normal--passengers usually have trouble sleeping the first night and then sleep well the second. Breakfast and afternoon tea were served in my compartment, delivered by a Thai steward. He also made the bed, took care of Customs declarations and answered questions. We ate our noon and evening meals at assigned tables in the dining car; I chose the early sitting. Four-person tables sat on one side of the aisle and two-person tables on the other side. Most passengers dressed in semi-formal attire for dinner. This dining experience gave me the feeling of being in an exotic movie from the 1930's. Teak-paneled walls and ceiling, gold and burgundy drapes, and delicate lamps decorated the inside of the car. Outside, oil palms and rubber trees and lush jungle growth flashed past the windows. 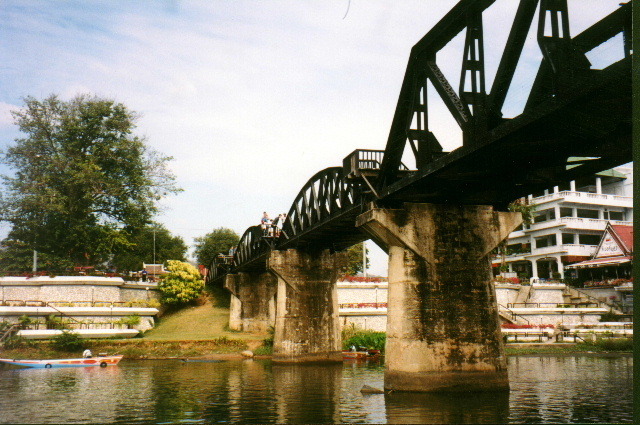 We stopped at Kanchanaburi that first afternoon to see the famous bridge over the River Kwai. The bridge was originally built in 1942 during construction of the Thailand-Burma Railway, better known as the "Death Railway." Under Japanese Army control, Australian prisoners of war built east from Burma and British POWs built west from Thailand. More than 61,000 Allied POWs and 250,000 Asian forced laborers built this 250-mile railway through mountainous jungle, at an estimated cost of 130,000 lives. The train manager told me Kwai is pronounced with a short a sound and silent i--as in quack without ck. He said translations use many different spellings (such as Khwae) to get across the correct pronunciation. The movie Bridge Over the River Kwai perpetuated the mispronunciation kwye, which is an offensive word in the Thai language. I didn't ask for a translation. After photographing the bridge, we boarded a barge and were towed down the river by a noisy motorboat that frequently drowned out our Thai tour guides. The variety of sights along the riverbank included thatched huts and palm trees, houses with lawns, houseboat villages, tropical undergrowth, jungle and marsh. A man riding an elephant in the water near the shore excited our tour guide. The elephant is the symbol of Thailand, our guide told us. "If you see or touch one, you will be very, very lucky." We entered the Mae Klong River and headed west, with the mountains of Burma to the south. Our next stop was the Chungkai War Cemetery, containing 1750 Allied graves. On the way back to the train station in a bus, we drove by Kanchanaburi cemetery with 6982 Allied graves. It sits next to a civilian cemetery in the town of Kanchanaburi. The third Death Railway cemetery is in Burma. Our train then backtracked one hour to return to the main railway line and head to Singapore. Walking through the plush Observation Car to the outside deck at its rear, I savored the feeling of this once-in-a-lifetime experience. The open-air portion of the car allowed me to sample the atmosphere as our luxury train snaked through exotic Thailand. The second afternoon we got off the train at Butterworth, Malaysia, for an excursion to Penang Island. Our tour bus drove onto a ferry and crossed to Georgetown, the capital of Penang. We all got in trishaws for a 15-minute ride through downtown Georgetown. The back half of a trishaw is a bicycle; a two-person seat between two bike wheels replaces the front wheel. It gives an uninterrupted view and a quiet smooth ride. Our drivers competed as they pedaled to get ahead of each other. My trishaw went out in front of the entire crowd, after starting last in our group. We alternated the lead with two others. My driver gave a running commentary of the buildings we passed. Half way through the ride I realized he wasn't merely jabbering; it was his job to explain the sights. So I started listening. Our bus tour guide told us trishaws in most countries have the bicycle in front of the cart. He joked, "Here in Malaysia they put the cart in front so it will get hit first in an accident." We arrived in Singapore mid-morning Friday. At an average train speed of 37 miles per hour, our trip took 47 hours and covered 1262 miles. I scratched another item off my list of things to do before I leave Japan.